In era of globalization technology is growing. Camera is a technology that has a rapid development. Not only features in the camera that are developing but also the design of the camera. Even the camera is now not only used by professional photographers, everyone now can use the camera. Do you know about SLR and DSLR cameras? Do you know the difference between the two cameras? 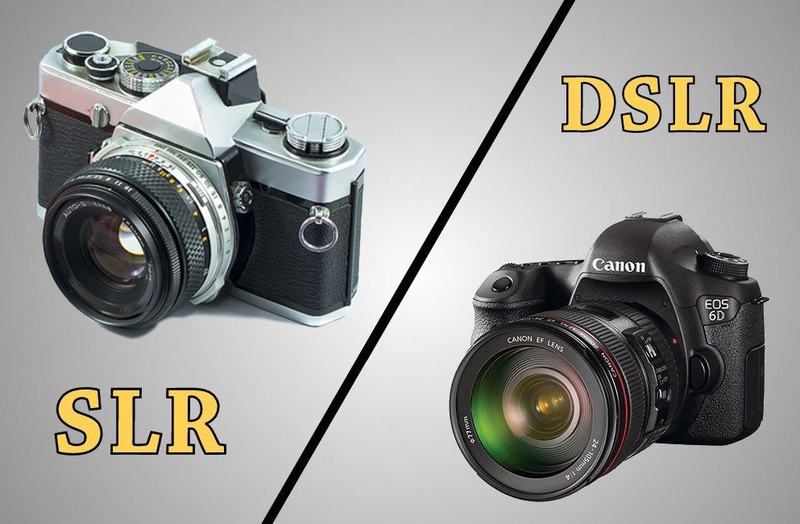 Now, we have decide to make a comparison between the two most popular types of cameras SLR and DSLR. Does anyone still use SLR? Single Lens Reflex camera (SLR) is based on a mirror-and-prims system that allows the photographer to see trough the lens and press the shutter button to capture a crisp photograph. SLR’s are used in professional photography, where the need for utmost quality is very high. SLR cameras allow expert photographers to change lenses and choose the right lens. This cameras can allowed for much better photographs due to an innovative solution to an old problem. Digital Single Lens Camera is a sophisticated and technically superior version of a regular SLR camera. DSLR cameras are great for building photographer. They offer live previews and do not waste film when photographers make mistakes. The use of very high quality sensors coupled with the capability to instantly review the image you took also gives modern day photographers an undeniable edge. The technology used according to the explanation above is different. Digital single-lens reflex for DSLRs. Refles mirror that allows live and digital optical viewing through the lens taking the image. Singl-lens reflex for SLRs. Reflex mirror that allows live optical viewing through the ens taking the image. What’s the another difference between this both cameras?. We will review the difference between SLR and DSLR camera. As mentioned earlier, the working of an SLR camera is more or less same as that of DSLR camera. The biggest difference between a SLR and DSLR is the method in which the camera records the picture. SLR cameras use film to capture pictures, typically in a 35mm format, while DSLR capture photos and videos in digital format into a memory card, which is later retried to be developed, creating real, crisp photographs that the film recorded. One of the biggest advantages to having a DSLR camera over an older SLR is the ability to store thousands of photos on a single memory card versus only a limited number of photos on a role of film. For this reason, DSLR cameras are the most popular choice among professional photographers, photojournalists, as well as shutter-bugs as well. A DSLR camera, on the other hand, contains a digital sensor, instead of film, that records the captured images or videos into a memory card. DSLRs and SLRs allow the photographer to view and focus the image using the attached lens. The first DSLRs had poorer picture quality than film SLRs. Advances in digital technology, including the number of megapixels available, have almost completely erased this difference. SLR typically have a speed of 1 to 1/1000th of a second and most modern DSLR have shutter speeds up to 1/4000th of a second, much as high end ones can have shutter speeds as high as 1/8000 and above. Since DSLRs are based on newer technology, they obviously offer a range of functions that you can’t expect from SLRs. To mention just a few, you can preview a picture after clicking it, and then delete it in case you don’t like it. This helps you select the best shot from a pool of pictures and trash the rest. SLRs images cannot be erased, and the film cannot be reused. Of course. They are still using SLRs as possible to find out how to take pictures. Enjoy the picture printing process, because there are photographers who are not solely to get good pictures. Despite being a few folds more expensive compared to their counterpart, the SLR and the DSLR were an indispensable tool in professional photography. For the reason, you can’t really choose a better camera between the two, because the distinction is not objective. It all depends on which method and technology style fit best with your photographing needs.